Back when Pac-Man Championship Edition was released in 2007, it felt like it was exactly what the classic series needed. 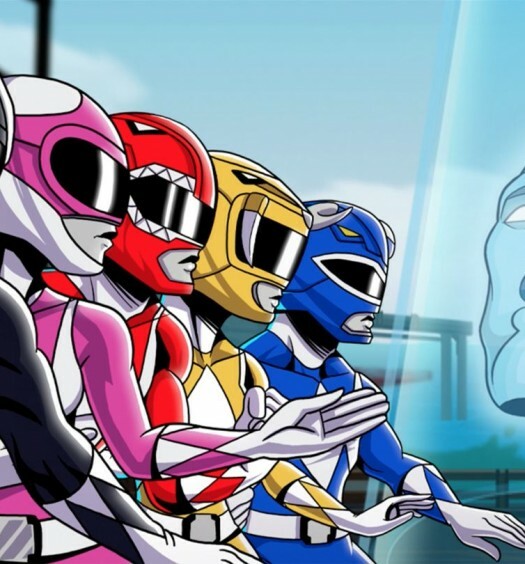 A refreshed, revamped take on a game that has often struggled to introduce new ideas that were not at odds with the core gameplay that has been loved by fans for more than thirty years. With only a content update (Pac-Man Championship Edition DX+) since then, the Championship Edition series remains the definitive way to play Pac-Man, but with the launch of Pac-Man Championship Edition 2, that could all change. Why? Because this edition changes the classic Pac-Man formula in numerous ways, leaving very little of the traditional gameplay untouched, aside from the aesthetic. For better or worse, BANDAI NAMCO has made a bold decision to change the game so drastically; casting aside nostalgia in favour of a game more focussed on speed running and score attacks, rather than completionism. 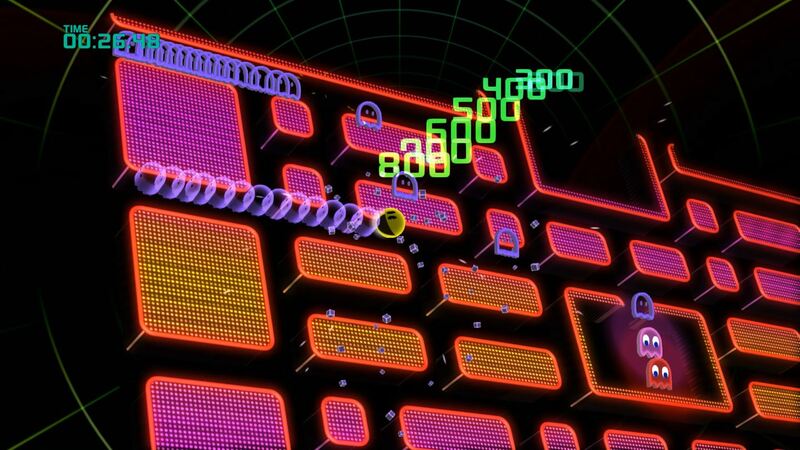 Neon dream – Even though the gameplay has changed considerably, the classic Pac-Man graphics and characters are present and correct, delivered in the same bright. effective style as they were in the original Championship Edition. The relatively simple visuals mean that the Xbox One offers little graphical upgrade compared to the previous Xbox 360 outing, but where additional style can be added, it has been. In particular, there is a lovely new animation for when Pac-Man devours a train of ghosts. On a related note, the visuals retain the weighty feedback of the original Championship Edition, meaning that whenever Pac-Man is involved in an impact on screen, the player knows it both visually and via the excellent use of force feedback. Rules rewritten – Taking a balanced view about what has changed in Pac-Man Championship Edition 2, I expect that anyone completely new to Pac-Man will find the game extremely enjoyable. There is now a tutorial (that is also useful for updating old hands to the changes) and a kind of story mode that includes boss battles and other diversions. 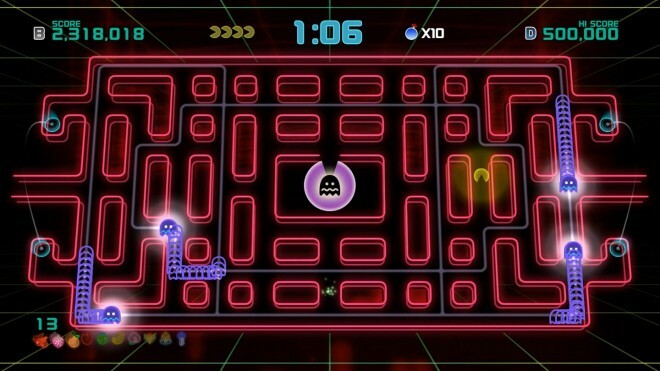 The classic Pac-Man score attack is also available, and now includes a large number of maze options and rules variations to enable practically limitless gameplay variations. As fun as it ever was – Despite the fact that this is not the Pac-Man I know and love, it is highly enjoyable all the same. 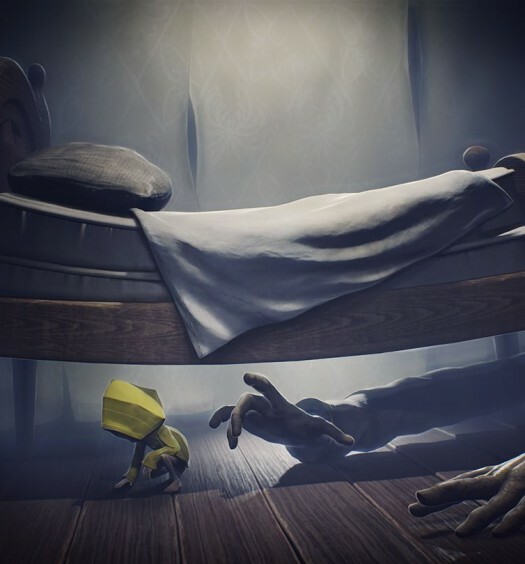 I’ll detail more about what I don’t like later, but the game has been softened in many ways, meaning it is now more accessible than ever before. 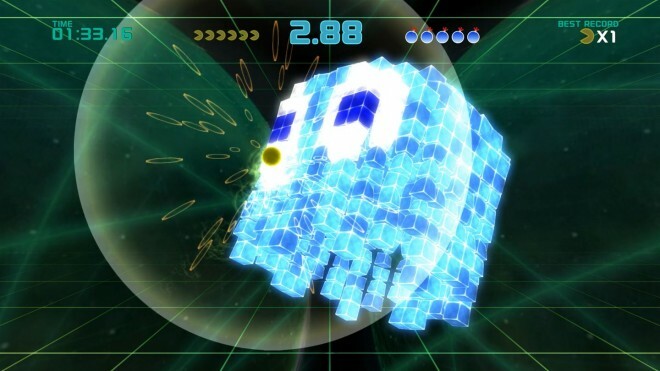 The new style of gameplay lends itself to a lower bar of entry, but the additional complexities of bomb jumps, ghost trains, passive ghosts, roaming fruit and suchlike can lead to advanced strategies. For example, to achieve the best score, it is no longer necessary to eat all of the basic dots, but instead to eat enough to activate more lucrative prizes such as fruit and ghosts before rushing onto the next level. Too many gimmicks – I wrote before about bomb jumping, ghost trains and passive ghosts, not to mention bosses, braking, weird new controls and a load of other stuff. I’m not sure a Pac-Man game needs any of these things, with some of them particularly unwelcome. For example, Pac-Man is now able to touch ghosts up to three times in quick succession before they become angry and attack him. This, and Pac-Man’s ability to brake to a complete halt are both completely at odds with the gameplay mechanics that I, at least, have been accustomed to since I was seven years old. Too damn easy – With all these new additions, my overall feeling is that Pac-Man Championship Edition 2 is considerably easier than previous versions of the game. 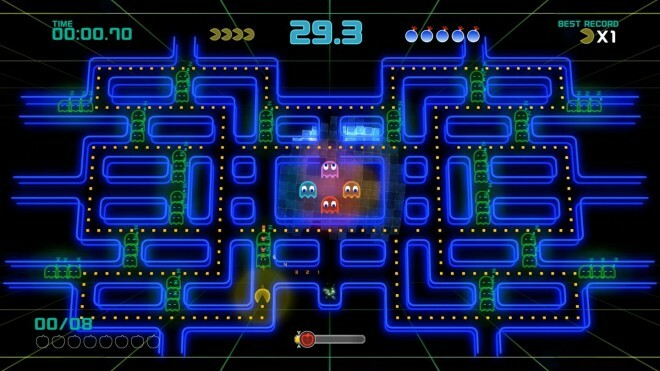 In the past, there has always been a feeling of cat and mouse gameplay as Pac-Man struggled to track down the last few dots whilst evading an increasing number of ever faster ghosts. Now, there are barely any consequences for hitting ghosts at all, and when one is made angry, Pac-Man can simply bomb jump to safety on most occasions. I am generalising a bit; the game gets incredibly intense later, but it is a bit of a paradigm shift from the gameplay I remember to the more heavily score attack focussed gameplay we see today. I have mixed feelings about Pac-Man Championship Edition 2. It is still a very enjoyable game that, with any other name, would standalone as a fun, feature rich and exciting title. Unfortunately, what I wanted was something that resembled the first Pac-Man Championship Edition (and the Pac-Man games I love) a lot more closely. Newcomers and speed runners will probably love this version, but those looking for nostalgia will find the game sadly lacking. Pac-Man Championship Edition 2 was developed and published by BANDAI NAMCO on Xbox One. It released on September,13 2016 for $12.99. A copy was provided for review purposes.